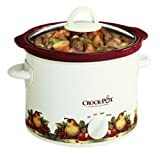 Amazon.com Price: $85.99 (as of 2019-04-25 14:10:21 GMT) Product prices and availability are accurate as of the date/time indicated and are subject to change. Any price and availability information displayed on Amazon.com at the time of purchase will apply to the purchase of this product. Prepare nutritious and home-cooked meals easily and with style. Just fill up your crock-pot before you head off to work and come home to a delicious meal. The SCR300-R-NP serves approximately 3-4 people and provides high and low cook settings. Clean up is also easy with dishwasher safe removable stoneware that doubles as a convenient serving dish complete with glass lid. Features include 3 heat settings, stay cool handles and tempered-glass lid. Delonghi Electric Moka Espresso Coffee Maker just $34 Shipped!